Liquor wholesalers across the United States collect more than $5.5 billion in federal taxes each year. It’s a big business that traces its roots back to 1933. That’s when Congress used the 21st amendment to repeal prohibition and create a three-tier system of alcohol distribution that mandates producers and suppliers of alcohol to sell straight to distributors, who then sell to retailers, who then sell to consumers. Each state has its own method, and some state governments operate their systems while others contract with private companies. It’s a convoluted and confusing system that makes delivery and payment time-consuming and cumbersome. Scott Riley is changing all that. He’s the CEO of Fintech, and has developed a revolutionary system for the liquor industry that harnesses the power of big data to make the payment process faster than ever before. 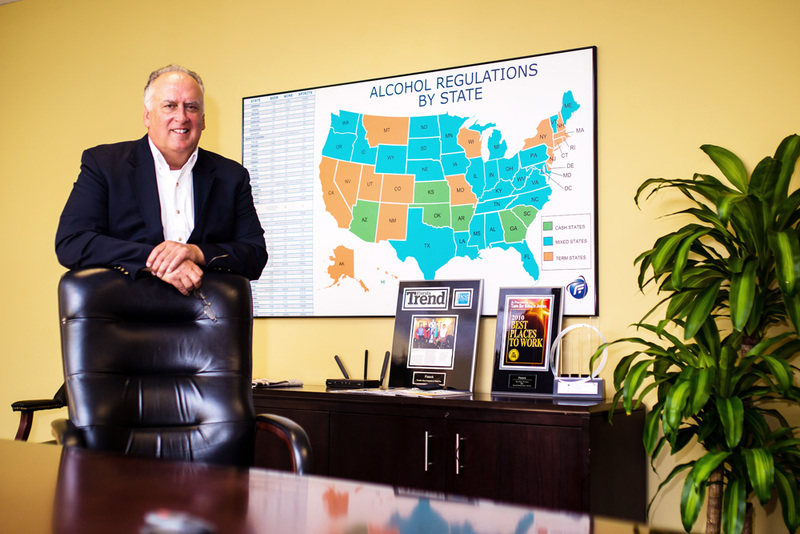 An alcohol regulation map hangs on the wall in Scott Riley’s office. 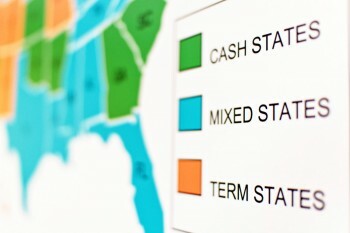 Breaking down payment terms for liquor wholesalers by state, it serves as a reminder of the payment complexities the alcohol industry faces and Fintech’s mission to reduce such difficulties. With other systems, retailers wait until the end of the month to get information. With Fintech, results are instant. Riley can tell a chain restaurant how many bottles of a certain tequila brand were sold the night before in a specific market. He can give them price breakdowns and comparisons between regions. He can show them when they’re making bad buying decisions. Splitting cases, for example, results in surcharges. “Our system can handle hundreds of thousands of transactions per hour,” Riley says. Fintech represents 275,000 relationships between retailers and distributors each day, with an average bill of $800. Precision is critical. Fintech serves major clients like Hyatt, Outback Steakhouse, Target, Kroger, Costco, Trader Joes, Walgreens, CVS, Wal-Mart, and Sam’s Club. Retailers that miss just one payment get penalized by the state and risk being placed on a temporary no-sell list. This has driven Riley to move to an ultra-secure system, with multiple redundancies and methods for disaster recovery. Because Fintech can mine such valuable information, Riley is repositioning his company to sell much like credit card vendors and cell phone providers. The company has two revenue streams—direct sales and third-party retailers. Clients who buy from a third party receive a better price. This strategy allows Riley to tap into thousands of sales people across the nation. He has recently signed an agreement with the National Restaurant Association, which will become a Fintech provider, and Fintech will get access to their 500,000 members nationwide. The move, announced in early 2014, led to Fintech’s biggest month ever.